Call Master Plumbing to repair your hot water heater in Potomac! If you need hot water heater repairs, then you’ve come to the right place. Master Plumbing is trusted both in Potomac and all over the state of Maryland. After a long winter, your hot water heater could be worn down from all the usage you demanded from it. So if you’ve encountered some unusual problems, here are ideas for attempting the repairs yourself. Take a look at the condition of the pilot light. On a gas water heater, you’ll need to open a tiny panel that is almost too small to notice. This panel will be on the bottom of the hot water heater. When it’s time to make hot water heater repairs, you will need to open this panel. If the pilot light is out, you will need to relight it. Luckily, all you need is a match or a lighter, nothing complicated Make sure the flame stays lit because if it does, it should regain normal function and start heating water for your Potomac home again. But what happens if it won’t stay lit? You could try cleaning off the burner. If that doesn’t help, you’re going to need a new thermocouple instead. The thermocouple is a simple component of your hot water heater that you should be able to remove and change out easily. 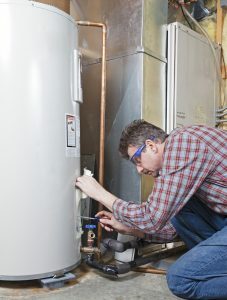 Before you complete any hot water heater repairs, make sure to turn the gas supply first. Your owner’s guide will show you how to find and extract the thermocouple from what is called the aviator line. Once the new thermocouple is on there, restore the gas supply and look for possible leaks. Once you are satisfied there aren’t any leaks present, you can turn the pilot light back on. Your Potomac home might feature an electric hot water heater rather than a gas-powered one. Push the reset button long enough to hear a click. If this doesn’t work, you might need to switch the circuit breaker on and off. But if the breaker does nothing, you might need a new thermostat installed instead. So what do you do? Start this step by turning off the power supply. Then switch the breaker off for now. This way, you can prevent the risk of shocks or electrocution. Remove the thermostat and have it inspected by professionals and replace it if necessary. Give Master Plumbing a call at (301) 650-9100 or contact us online to get more information on how our expert plumbers can help you with your Potomac home’s plumbing system. We have received Angie’s List Super Service Award recognition for plumbing and drain cleaning every year since 2007, in addition to the Best Plumber award from Best of Bethesda. We are fully licensed, bonded, and insured and our service is unparalleled. Give us a call today—you won’t regret it! To see examples of our projects, follow us on Facebook, Twitter, and Pinterest.